This post is written by Niall O’Hanlon. Mr. O’Hanlon joined the IMF in 2015 as a senior economist in the Real Sector Division of the IMF’s Statistics Department. Prior to joining the IMF, Mr. O’Hanlon was Head of Prices Division at the Central Statistics Office Ireland (CSO). During his 14-year career at the CSO he introduced a number of new statistical products including the Residential Property Price Index (RPPI) and the Services Producer Price Index (SPPI). Since the global financial crisis there has been significant progress internationally on the measurement of house prices. When the BIS first published its database of residential property price indexes in 2010, 37 countries were included. Today it covers 57 countries, including 18 of the G-20 countries and all of the EU member states. A 2009 Report to the G-20 Finance Ministers on the Financial Crisis and Information Gaps identified data on the stock of dwellings, the associated price levels and their changes over time as critical ingredients for financial stability policy analysis. 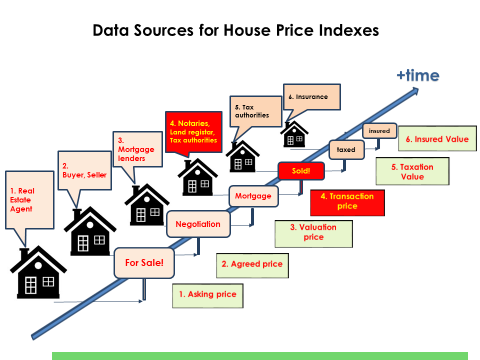 In 2013 the Handbook on Residential Property Price Indices (RPPIs) was published by Eurostat to provide guidance and identify best practices so as to help improve availability and cross-country comparability of house price indexes. These have been important milestones in the progress of house price measurement globally. The Global Housing Watch is also an important initiative in that it provides a platform for analysis of housing market developments worldwide. Greater availability of indexes has helped policy makers monitor excessive house price growth and take a mix of monetary policy, micro prudential and macro prudential measures. Housing markets are receiving increasing attention and there are renewed concerns that rising prices may pose risks to some economies. For example, in November 2016, the European Systemic Risk Board issued warnings to eight EU countries on real estate vulnerabilities which pose significant systemic risks. The map below shows that official indexes are available for 62 countries. The combined GDP of these countries accounts for around 90 percent of global GDP, making the coverage useful for multilateral surveillance. 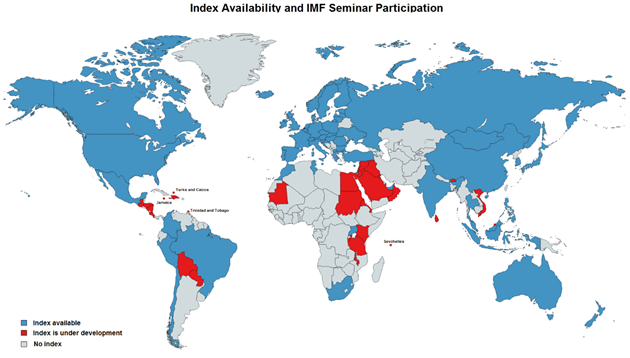 However, indexes are available for only about 30 percent of countries in the world (see map). So much more progress is needed to support policy needs in many countries. The IMF Statistics Department held its first seminar on house price index compilation in 2015. Since then, compilers from national statistical offices and central banks of 50 countries have participated. The seminars provide an overview of data sources and methods for compiling RPPIs, highlight the trade-offs involved in selecting a data source and address strategies for the longer-run development of data sources (see chart). The standard approach to compiling the consumer price index—comparing the prices of exactly the same products—cannot be employed since no two properties are exactly the same and we can only observe the price of property when it is transacted. Therefore, compilers must remove the impact of the changes in mix of properties sold (referred to as mix-adjustment) leaving a measure of “pure price change.” There are several techniques for mix-adjustment, varying in terms of sophistication and effectiveness. The more effective techniques require detailed information on the physical and locational characteristics of property (for example the property type and size, or characteristics of the neighborhood) as well as the transaction details (price and date). Securing access to data is often the biggest challenge—particularly in low income countries with less developed administrative systems. The comprehensive data on property characteristics and locational attributes necessary for adequate mix-adjustment might be unavailable. Data limitations can also mean that indexes do not have full coverage of the market. For example, using only bank data will mean that compilers miss cash based transactions. In response, compilers are looking beyond single administrative data sources towards combining different data sets to facilitate sophisticated mix-adjustment techniques. For example, the Central Statistics Office of Ireland recently switched from using mortgage data to a combination of taxation (transaction), building energy rating (physical characteristics) and census of population small area data (relative affluence or disadvantage of a neighborhood) to give a more complete and accurate picture of house price change. Compilers also are using big data sources, such as real estate web portals, for more timely and comprehensive data. Ultimately, the choice of source data will require trade-offs, in respect of comprehensiveness, coverage and timeliness. House prices matter for macro prudential purposes, as well as for socio-demographics. Buying a house will be the biggest single spending decision many households make and that decision should be guided by good information on the rate of price change and how current prices compare to longer term trends. Progress also has been made in respect of other housing related social indicators that are emerging. For example, the OECD produces price-to-income and price-to-rent measures for selected countries. These indicators of long run over or undervaluation relative to long term averages help to provide a more complete picture of the developments in the housing market. Housing market research, much of it by private sector index compilers, is increasingly concerned with measures of inequality and exclusion. For example, Zillow recently published a study on the widening gap between the bottom and top of the US housing market. More broadly there is interest in how house prices impact household balance sheets and, in turn, on consumption by households. Ownership by gender, age, cultural background or income also may add important policy dimensions. For many countries the new challenge is to move beyond just compiling house price indexes and to address the need for a more complete picture of the housing market and its impact on society.